For detailed specifications, contact us today. 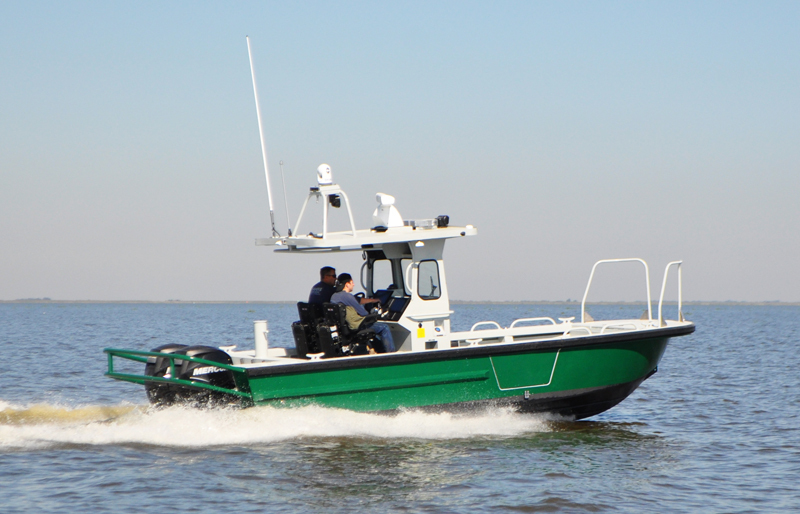 Like the other offerings in Metal Shark’s Courageous line of center consoles, the rugged 25 Courageous is a versatile deep vee craft designed for utility, law enforcement, and fire rescue applications. 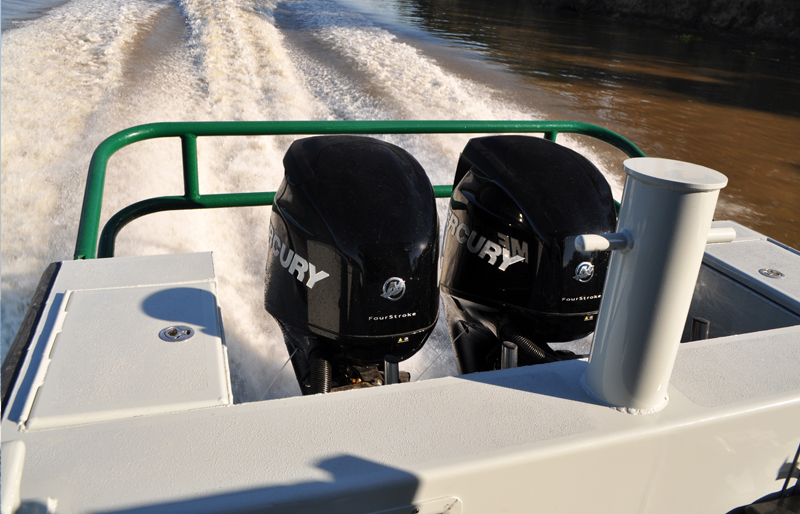 It is essentially the same platform as Metal Shark’s venerable 27 Courageous with the primary difference being that the twin outboards of the 25 Courageous are mounted directly on the transom, as opposed to being mounted on an extended transom bracket as they are on the 27 Courageous. A truly rugged workhorse, the 25 Courageous boasts a proven hull and stout construction that assure outstanding sea keeping while providing a stable and dry platform at rest. The 25 Courageous boasts a proven Metal Shark hull design that has been engineered and built to deliver maximum economy, performance, and longevity. To achieve its superior hull life rating, the vessel’s hull, deck, and console are composed entirely of heavy, precision-welded plates of corrosion-resistant 5086 aluminum-magnesium alloy. With an 8’ 6” beam, the 25 Courageous may be easily trailered, while on the water its impressive 20,000 lb. towing capacity gets the job done. Metal Shark is an OEM supplier for all major outboard brands and can rig according to customer preference or fleet commonality requirements. 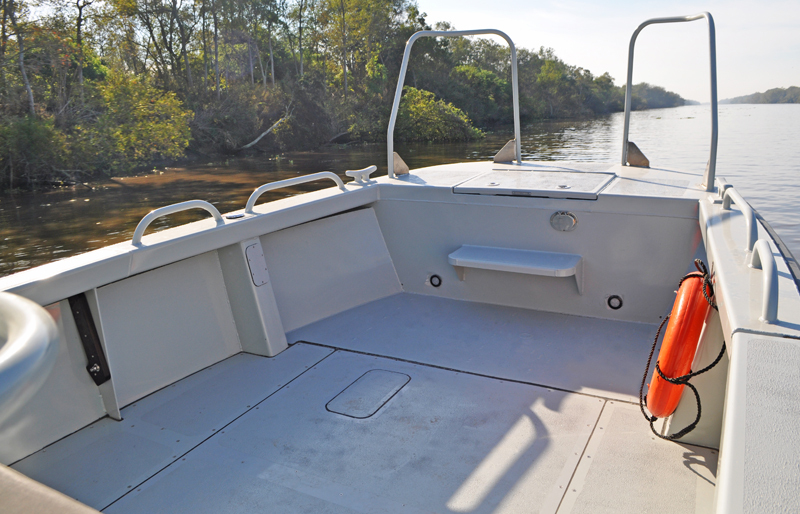 The 25 Courageous features a tested and proven no-nonsense workboat layout that allows for safe and easy access around the boat. With its generous bow flare and deep freeboard, the 25 Courageous boasts an extraordinarily roomy self-bailing cockpit that is serviced by oversized 6” scuppers. The 25 Courageous has been generously equipped with an extensive complement of standard equipment, from its 100-gallon heavy duty baffled aluminum fuel tank to its six 8” welded cleats. 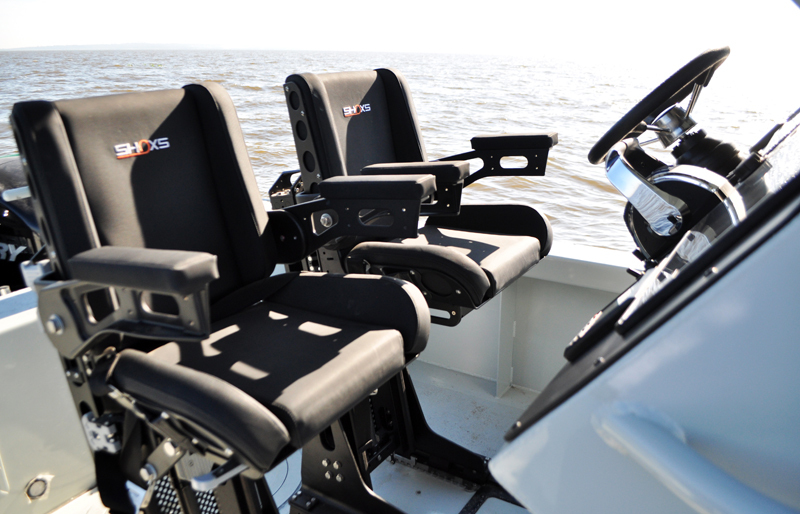 The optional equipment list includes an array of console configurations, tops, and enclosures, one or two-piece dive door, 500 pound-capacity removable electric davit, shock mitigating seats, MK9 tripod mount, custom electronics, and much more. The 25 Courageous has been designed for easy handling by a lone operator. 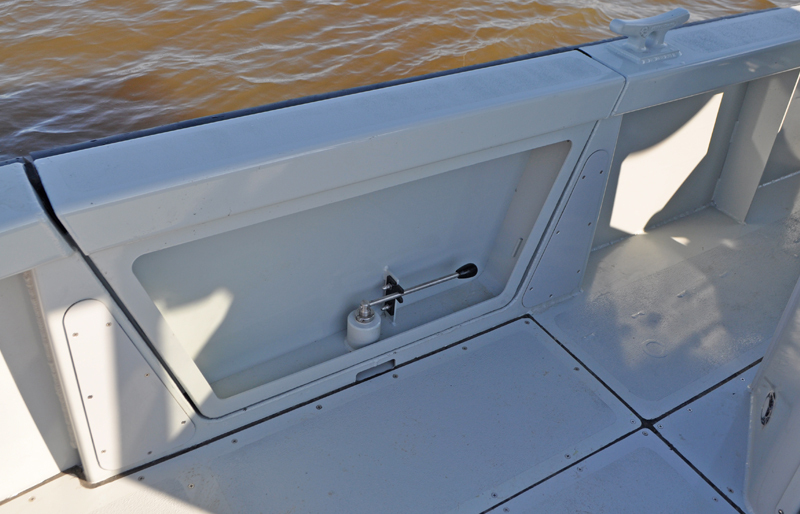 A large dash area easily places all instrumentation front and center, and vessel controls are placed within easy reach. 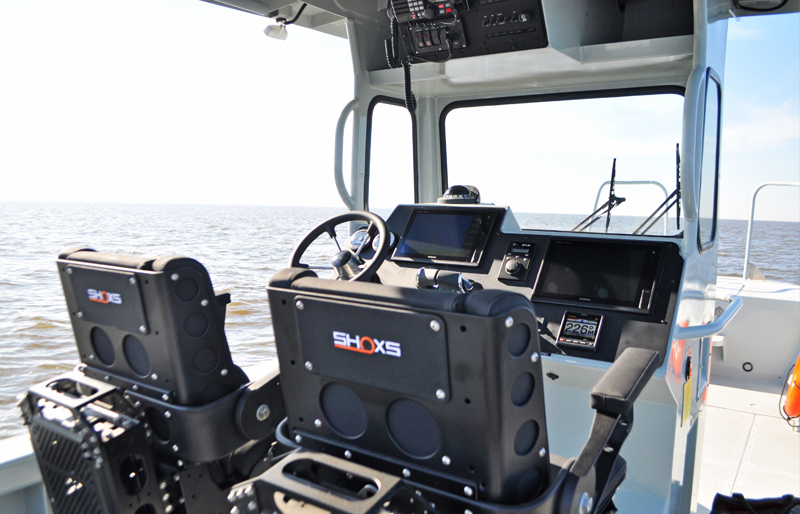 A full height console windshield combines with a massive aluminum T-top to provide outstanding visibility from the helm while enabling all-weather operation. An integrated overhead electronics pod provides a mounting area for communications equipment and lighting and siren controls. A full curtain package may be added to the top for further crew protection, and optional shock mitigating seating allows for additional safety and comfort. Like all Metal Sharks, the 25 Courageous is a fully custom vessel that is built to order, so the customer may determine the dash components as well as their layout. 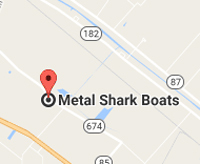 For more information on this or any other Metal Shark model, contact us today.